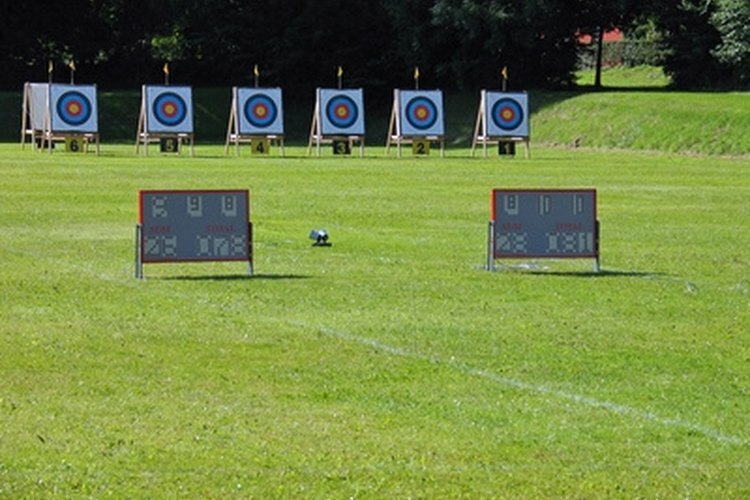 Use the archery range to properly adjust your compound bow. Archery is a precision sport where the archer anchors the bow at full draw and releases the arrow at the intended target. To improve the accuracy of compound bows, sights are often installed. Sights utilize a series of pins--typically three to five fiber-optic pins--to mark the distances to different targets for windage and elevation. Sighting-in a bow sight is essential for consistent, accurate shooting, but it takes concentration and preparation. Install the bow sight on the riser of the compound bow. Secure placement is crucial so the bow sight does not move during shooting. Use the allen wrench to adjust the sight housing up or down to line up with the sight window. The sight window is the sight angle as you look through the peep on the bow string to the sight. You want the sight housing to be perfectly centered in the peep. Carry your allen wrench in your pocket or hip quiver on the archery range. Shoot a group of three to five arrows at 10 yards. Note the general location of the arrows and adjust the top sight pin accordingly. Use the allen wrench to adjust the set screws to move the sight pins. Adjust the windage first, or the distance to the left or right from the target. Move the sight in the direction that the arrows are hitting the target. For example, if the arrows are hitting to the right of the target, move the sight pin to the right. Adjust the elevation, or the distance up or down from the target. Follow the same rule for adjusting the elevation. After the adjustments have been made, shoot another group of arrows and make another adjustment, if necessary. Move back to 20 or 30 yards and shoot another group. Adjust the windage and elevation as necessary. Make small adjustments to the sights between groups. Continue making adjustments for every sight pin until every pin is sighted-in for the appropriate distance. Take your time and focus on shooting form during every shot. Inconsistent shooting form can result in decreased accuracy. Consult your local archery pro shop if you are having difficulty adjusting the sight. Always be aware of your surroundings while shooting.